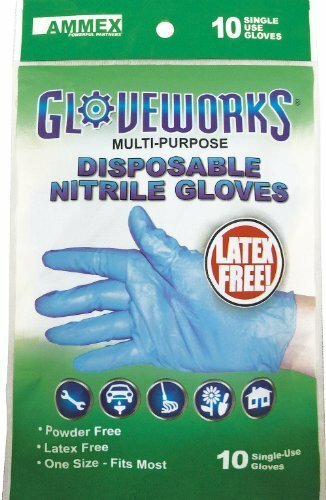 The Ammex GWN10PK Gloveworks blue nitrile disposable glove is latex-free, an allergy-sensitive alternative to latex. Nitrile also helps protect against many chemicals. The glove is single-use and powder-free to help prevent contamination. It is available in one size, which fits most hands. 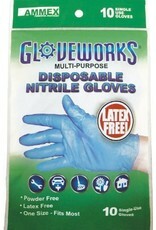 Disposable and limited-use gloves are used in medical, forensic, scientific, food service, and industrial applications. Disposable gloves are commonly made from flexible materials such as latex, nitrile, chloroprene, and vinyl. While most disposable gloves are designed for use on either hand, some can be purchased in hand-specific models. They are offered powder-free; with a standard length cuff; non-sterile; and with smooth fingers, fingertips, and palms. A glove's abrasion, cut, and puncture resistance are defined by glove material and thickness, and may be improved with the use of exterior coatings. Abrasion resistance means the glove helps protect the hand from contact with rough surfaces. Cut resistance means the glove helps protect the hand from blades and sharp instruments. Puncture resistance means the glove helps protect the hand from objects such as needles. Chemical resistance means the glove helps protect the hand from certain chemicals, and varies by glove material.